It rained in Menlo Park – and then it rained some more! 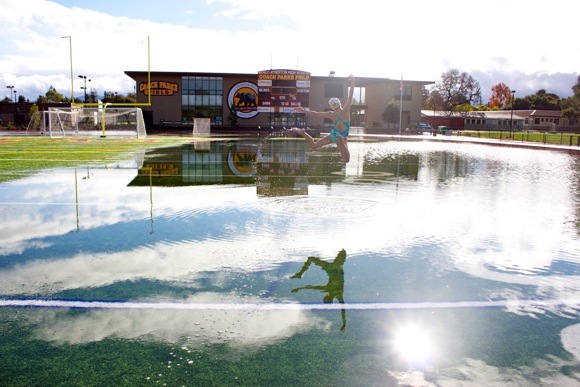 Editor’s note: We couldn’t resist using M-A teacher Betsy Snow’s photos of Amanda Hutchinson cavorting on the underwater football field taken last Friday with this updated rainfall report from InMenlo weather watcher Bill Russ. Now shortly before noon, it has largely stopped raining here in Menlo Park. Wow — 2.05″ for this morning’s storm! My season-to-date total is now 8.95″, well above the two inches recorded last year at the same date. Not surprisingly, there were only a few stalls at today’s Farmers Market in downtown Menlo, and shoppers were scarce. One thing I noticed before this latest storm is that my 6.9″ was higher than the San Francisco Airport reading. They were at 5.08″. Weather watchers may want to know the that the 10 Santa Clara water banks are at an average of 37% of capacity. I will check that regularly and report after these series of storms. Another seasonal note: there’s just 9:45 minutes of daylight.